The UN humanitarian adviser for Syria called on Wednesday for access to the eastern Ghouta town of Douma, where he said some 80,000-150,000 civilians were "on their knees" after years of siege and fighting. Syrian government forces backed by Russia have recaptured nearly all of eastern Ghouta, which was the last major rebel enclave on the outskirts of Damascus, in a ferocious assault that began in February, marking a major victory for President Bashar al-Assad. 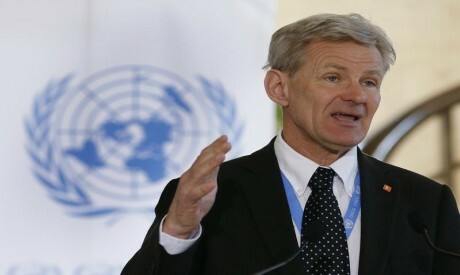 They were now negotiating with the armed group inside Douma, the last remaining area under armed opposition control, adviser Jan Egeland said, adding that the United Nations was playing no direct role. "We hope that that agreement will lead to people being able to stay if they choose to, to get amnesty for those who put away their arms but also to an opportunity to leave for those who choose to leave Douma," he told a news briefing. Out of the nearly 400,000 people besieged in eastern Ghouta for years by Syrian government forces, 130,000 had fled in the last three weeks, Egeland said. Evacuations should be voluntary but in some cases might not have been, he added. "The deals might have shortened the battle and that is a good thing. The worst possible thing would have been fighting street-by-street, like in Raqqa, until the very, very bitter end," he said, referring to the northern city where Islamic State group was defeated last year by US-backed forces. The evacuees included 80,000 people now in centres in government-controlled areas, where Egeland said conditions were terrible. Some 50,000 fled to opposition-held Idlib, which Egeland called "the biggest cluster of displacement camps in the world" with around 1.5 million people. "We need to learn from the battles of Homs, Aleppo, Raqqa, Deir al-Zor, and eastern Ghouta. Idlib cannot become a battle zone, it's full of civilians and they are vulnerable displaced," he said. With no reports of recent fighting or air raids in eastern Ghouta, he hoped the battle there was now over. Rebel group Jaish al-Islam, which has not confirmed any deal with the Syrian government over eastern Ghouta, released five prisoners on Wednesday as part of a deal over Douma, the Syrian Observatory for Human Rights and state media said. "We would then say anywhere between 80,000 to 150,000 are in the Douma area still under control of the armed opposition groups, Jaish al-Islam the biggest," Egeland said. "Why can we not deliver to the people of Douma today for example even though we are on the eve of a deal for Douma, they are really, really on their knees in terms of needs."